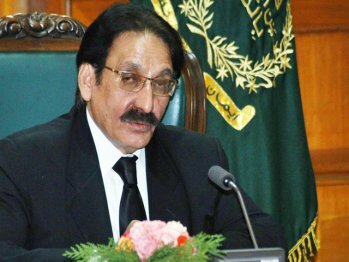 ISLAMABAD – Supreme Court Chief Justice Iftikhar Muhammad Chaudhary on Saturday ordered that the services of Arjum Ram K Talreja, the Karachi deputy registrar, and Pervez Ahmed, the Lahore deputy registrar, be dispensed with after giving them a month’s notice. The two officials are working on contract. The CJP also ordered putting up the file for promotion of eligible assistant registrars against the two vacancies immediately. The decision was taken in view of a recent order passed by the Supreme Court while hearing a suo motu case. In the said order, the SC had directed the Establishment Division secretary and provincial chief secretaries to ensure that any civil servant or other people who were re-employed must have their cases examined in terms of the provisions the of law. It was noticed that two deputy registrars, Arjan Ram K Talreja and Pervez Ahmed, were working on a contractual basis. However, following the SC judgment, their cases have been reviewed and it was noticed that due to their contractual employment, the prospects of promotion of eligible assistant registrars were apparently blocked. In case their contract employment is dispensed with, two vacancies of deputy registrars will be available for filling, against which two assistant registrars can be considered for promotion. The re-appointment of Dr Faqir Hussain as the SC registrar was also reviewed and found to in compliance with instructions contained in Rule 14(1) of the Civil Servants Act, 1973. It was observed that the re-employment of Dr Faqir Hussain on contract basis for two years did not create hurdles for the promotions of others, therefore, his re-employment was found in order and under the rules.